Achievements: 1st Team All-League as a Junior. Top 5 in the state last season in field goal percentage shooting. Leadership: Alex is our team leader because he not only says, but he does the right things every single day. He is the vocal leader who other players listen to and respect. He is always encouraging, but holds his teammates to high standards. He is able to do this because he holds himself to those high standards and is a great example of the type of player we want in our program, because of his work ethic and commitment to excellence. 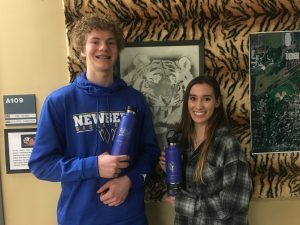 Service to Others: As an ASB Senior leader, Alex is constantly volunteering and working on projects that benefit other students and help make NHS a better place. He goes above and beyond in the amount of time, energy, and effort he puts toward doing whatever he can to make sure that others have a great experience. Whenever help is needed with a youth tournament or camp, Alex is quick to volunteer and is able to take on any responsibility he is given. He interacts extremely well with youth basketball players and helps them have a great experience. It is so encouraging to see him give back to the youth and the community! Character: Alex is hard-working, dedicated, fun-loving, genuine, and kind-hearted. He has an amazing ability to remain positive and focused on doing whatever it takes to reach the team goal, regardless of the adversity or success the team may experience. Karly is a starter on the NHS girls basketball team. She has had a tremendous start to her Junior season, leading the team in several key statistical categories. Karly is an incredible athlete but more importantly a great student-athlete. Karly is kind and respectful to teammates and coaches. She is a true leader not only by example, but vocally with her teammates as well. She is a great role model for the youth in our community. On Saturday mornings Karly can be found working with youth basketball players in our Tiger Paw program. Karly is committed to being there whenever she is needed for anything basketball related. She is well deserving of this recognition.